Maria Rosa DiSanto first appears in the Painesville, Ohio, area from 1922 to 1928. 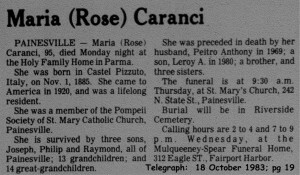 In America, Maria Rosa DiSanto was known by her married name, Rose Caranci. Maria Rosa DiSanto was born on October 31, 1895, at Castelpizzuto, Italy. She married Pietro Caranci, son of Antonio Caranci, on October 5, 1919, at Italy. Maria Rosa died on October 17, 1983, at Holy Family Home, Parma, Cuyahoga Couny, Ohio, at age 87. Her body was interred at Riverside Cemetery at Painesville, Lake County, Ohio. Maria Rosa DiSanto immigrated to the United States at New York City, New York, on June 12, 1920, at age 24. Maria and her husband, Pietro Caranci, were traveling to Cleveland, Ohio, to join Pietro’s brother, Domenico Caranci. She became a citizen of the United States on March 7, 1938. Maria resided at 227 Sanford Street, Painesville, Lake County, Ohio, when she was naturalized. 1. An un-named child was born on April 6, 1921, at 7808 Connectucut Avenue at Cleveland, Cuyahoga County, Ohio. This premature infant passed away within 60 minutes. Her body was interred at Calvary Cemetery at Cleveland, Cuyahoga County, Ohio. 2. Leroy Anthony Caranci was born 1922, at Ohio. He married Helen Turner, daughter of Jessie Turner and Nona Crowe. Leroy Anthony died in 1980. His body was interred at Riverside Cemetery at Painesville, Lake County, Ohio. 3. Joseph Caranci was born on January 7, 1926, at Ohio. He married Dorothy Mainella, daughter of Costanzo Mainella and Frances Zampini. Joseph died on October 29, 1992, at age 66. His body was interred at Riverside Cemetery at Painesville, Lake County, Ohio. 4. Philip Caranci was born on May 1, 1929, at Ohio. He married Betty Thompson, daughter of Charlie Thompson and Gertrude Allen. 5. Raymond Caranci was born on July 13, 1930, at Painesville, Lake County, Ohio. He married Gerri Halko on December 22, 1951. Raymond died on June 5, 2005, at West Palm Beach, West Palm Beach County, Florida, at age 74. His body was interred at Riverside Cemetery at Painesville, Lake County, Ohio.